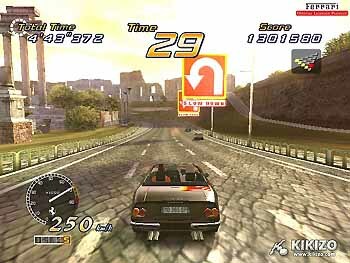 Let's be honest, when we all first heard that a relatively obscure, unknown UK-based development studio by the name of Sumo Digital Ltd would be handling the conversion of one of AM2's most visually incredible arcade games of all time, some of us were more than a little worried. 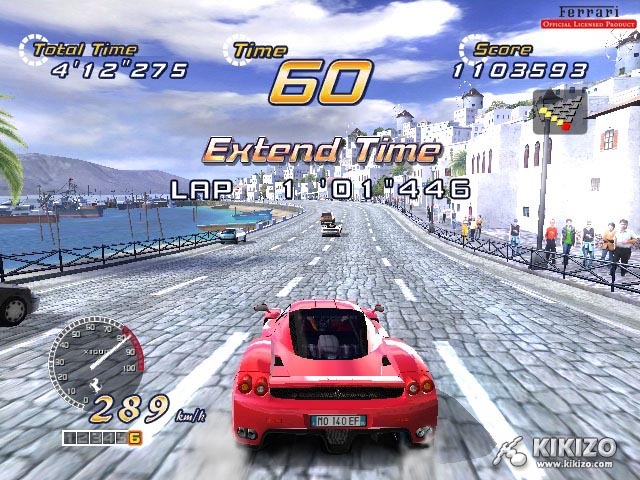 Even when the Xbox announcement finally came - confirming speculation that began ever since we played the arcade original - the screenshots that were issued with the Sega Europe press release didn't shed any light on the true quality of the conversion. After all, the arcade version might run on the same hardware, but there's a whole lot of extra memory on the Chihiro board - memory we feared Xbox might have to sacrifice frame rate or some level of detail to run the home version. It's not like it's not happened before. 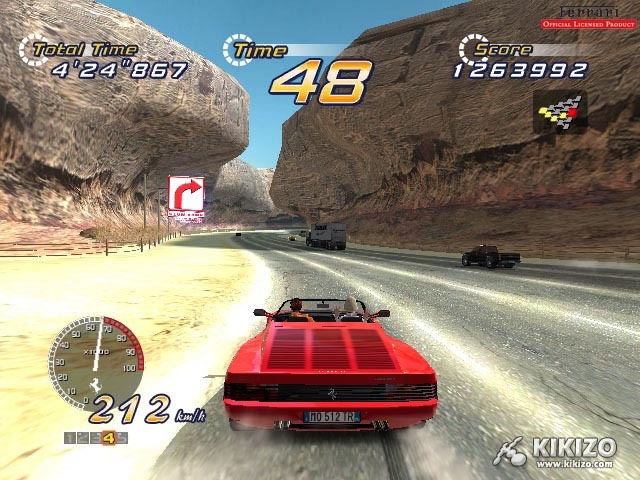 Most straightforwardly, Xbox OutRun2 is visually "arcade exact". But I'm here to tell you now with absolute certainty - this is the most arcade perfect Sega conversion I have ever seen. Bar none. Not even the S-TV-Saturn ports (they were nigh identical hardware as well). If you've played OutRun2 arcade, then you'll know that the astounding, vibrant visual quality is part of the overall, joyfully indulgent experience - and you will also know exactly what the Xbox version looks like. We played the exact same build of the game that is on the E3 show floor today, and in terms of the game engine, the conversion is basically finished already. Of course, there's a whole truckload of extras being worked on and some fine-tuning to be done before the game's release in Q4 this year. But the visuals - which we can confirm were presented in a fully compatible widescreen mode - are flawless. The framerate is a constant sixty with no drops, ever. The massive, detailed and exquisite scenery from the arcade moves perfectly. The draw distance is just as phenomenal as the coin-up - one specific part that caught my attention in the original where you can see for miles down a meandering section of road - was effortlessly executed on this home version. 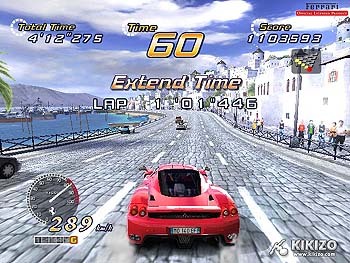 Other touches such as the rippling water, lighting effects, reflective bodywork, opponent cars, trackside detail and most spectacularly, the crash sequences, are all what you might call "arcade exact". So now that's out of the way, what about the rest? 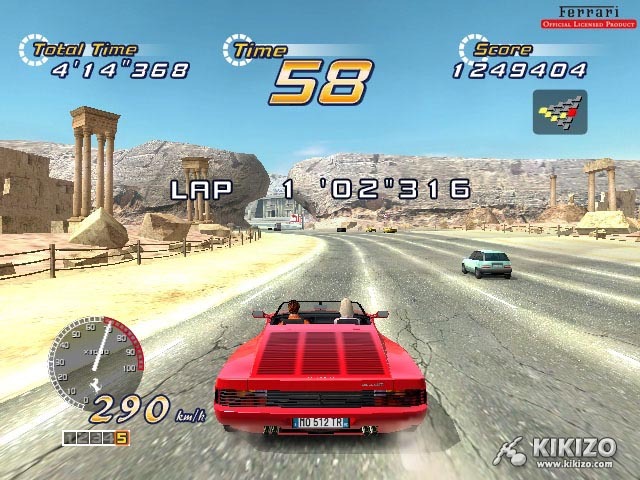 The version we played - and the mode that will be available to all E3-goers - is basically the same as the original Arcade Mode, called "OutRun Mode". 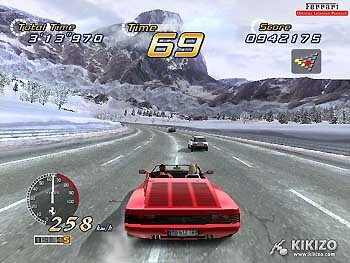 Those who've read our massive arcade coverage will know how it works - hop into your Ferari (perhaps a Testarossa or an Enzo), speed through five distinctly themed sections of road in sequence, taking either the left (easy) or right (hard) path at each intersection (that's a total of fifteen gorgeous race areas). The Heart Attack mode from the arcade mode is also in-tact. This mode has you follow the instructions of your pretty girl passenger - such as taking over a number of cars in succession or powersliding at certain points - and if executed properly, you'll see her 'heart gauge' rise, to get a hidden special ending. 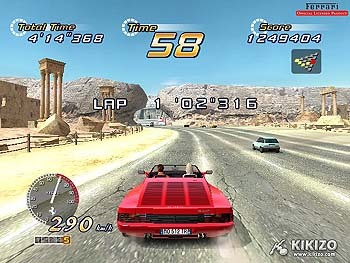 The modes unique to the Xbox version so far are "OutRun Mission" which introduces, er, missions to the racing action, and "Xbox Live" which - you guessed it - does indeed let you race with other gamers. It also lets you upload your best scores and download ghost car performances. 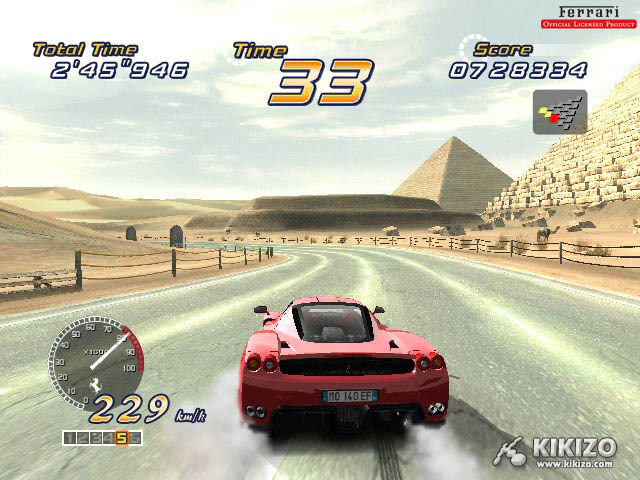 Xbox Live races will support "at least" four players, according to our man at Sega. The handling is represented as well as can be hoped considering we're now using the Xbox joypad instead of the arcade cab's wheel and pedals. 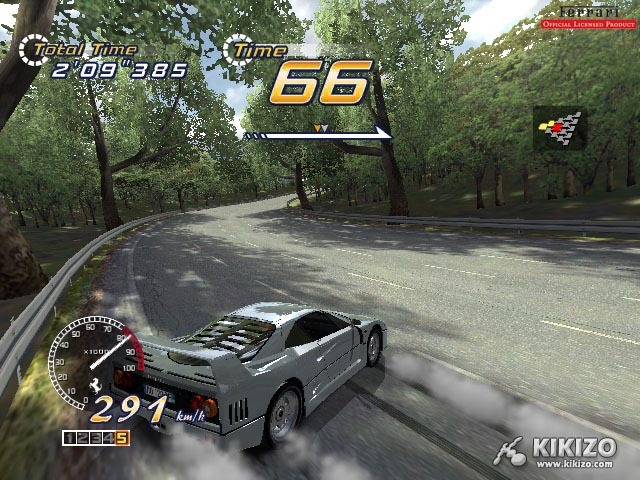 Let's face it, this isn't the most technical racing game, and personally I found the analog stick and trigger combination - and the way it's been tuned so far - worked perfectly for this game, where powersliding, quite ridiculously, for miles at a time is the order of the day. It's a tad easier to execute than in the arcade of course, because you can manouvre the stick left and right quicker than the wheel, but this is of course taken into account in the control mechanic, which is still being tweaked at the moment. The sparkling conversion, according to Sega Europe's Head of PR Asam Ahmad, is the result of "Sumo Digital taking the Chihiro source code directly, and optimising and compressing the memory and streaming process to run in 64Meg." Earlier builds didn't look quite as perfect as this E3 build, he revealed, but the overall process to get it so shiny was surprisingly swift. "They're now optimising memory for things like the number of on-screen cars, opponent AI, blocking and so on". Given that they've made the compression work look like child's play so far, it's safe to say all this will be taken care of quickly - although frankly these aspects seemed pretty spot on to us already. Combine the fantastic feel-good gameplay and legendary music, the wealth of added modes and bonuses, and all sorts of extra stuff that's "too early to talk about", and we have one mighty fine Sega title here. And to think all this happened thanks to humble Sega Europe, with the mere 'guidance' of Sega-AM2 at Sumo... when Mr Ahmad says that Sega's "a much more globally integrated company now" he's obviously not far off the mark - and this deal seems to be a very positive sign as far as Sega Europe's own content ambitions are concerned.